Flying drone for profit can make you good money. But did you know that drones business isn’t legal in the United States unless you obtain your own drone license complying with the FAA regulations? For the moment, it is not mandatory to have any certificate for recreational piloting of Unmanned Aircraft Systems (sUAS). At the same time, there are some requirements for non-commercial drones flights such as that sUAS weight should be under 55 lbs (24.9 kg), you should comply with FAA safety guidelines listed, and register your drone. However as soon as you plan to get paid for drones activity such as footage or goods delivery, you have to obtain remote pilot certification. ● Pass an initial aeronautical knowledge test at one of about 700 knowledge test centers approved by FAA. ● Get vetted by the Transportation Security Administration. 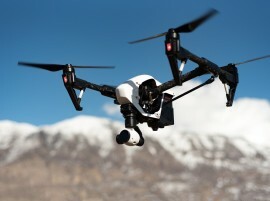 ● Obtain a Remote Pilot Certificate for a small UAS. ● Pass an aeronautical knowledge test every 24 months. ● Be at least 16 years old. ● Provide the drone and the associated documents or records for inspection upon FAA request. ● Report any accident, which caused injury or property damage over $500, to the FAA. ● Carry out all the required drones and control stations checks, preflight inspections, ensuring the safety of the operation. To find out more information, check the summary of the rules or the full 624-page document on Operation and Certification of Small Unmanned Aircraft Systems. If you wish to operate outside the framework of Part 107 (flying beyond visual line of sight, nighttime flights, etc), you will be required to obtain an additional permission from the FAA. How much does it cost to obtain a drone pilot certificate? It only costs $5 to obtain a commercial sUAS registration number. According to Part 107, drone operators are obliged to pass the FAA Aeronautical Knowledge exam. Usually, one of two companies, Computer Assisted Testing Service (CATS), and PSI / LaserGrade Computer Testing has been in charge of this test. Currently, there are about 700 knowledge test centers in the United States approved by FAA. You will also have to pay the fee for aeronautical knowledge exam at a licensed test center, which will cost you $150. We recommend you to always consult official sources to ensure that you comply with all actual rules. Using drones, even an unprofessional operator can get a fascinating photo and video footage as well as make stunts and tricks, but all this requires some preparation. Drone control is a complex process, but everyone can learn this by passing the course.